George J. Schreiner, 90, formerly of 708 N. Wisconsin St., Port Washington died Saturday, July 16, 2005 at the Harbor Cove in Port Washington. 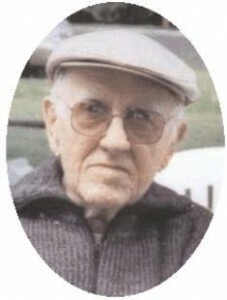 He was born on January 29, 1915 in Port Washington, son of Jacob M. and Susan Theiss Schreiner. He grew up in Port Washington, attending local schools. As a young man he worked in Northern Wisconsin with the Civilian Conservation Corp. (CCC). During World War 2 he was a member of the Army, attaining the rank of Staff Sergeant in the 28th Infantry. He served from July 15, 1941 to Sept. 24, 1945 and was a purple heart recipient. Upon returning home he married Natalie Reiter of Port Washington on September 28, 1946 at St. Mary’s Catholic Church in Port Washington. She preceded him in death on December 25, 1968. On October 3, 1970 he married Viola Lanser-Weyker of the Town of Belgium at St. Mary’s Catholic Church in Port Washington. She preceded him in death on September 1, 2003. George was an upholsterer for the former Wisconsin Chair Factory in Port Washington. He was a long-time machinist for the former Kwik Mix/PCM/Trac Mfg. Company almost 30 years, retiring in 1980. He was a lifetime member of the Veterans of Foreign Wars Belgium Memorial Post 5373 and the International Association of Machinists and Aerospace Workers Local 1430. He loved to be outside in his garden and playing cards with family and friends. He enjoyed painting landscapes and nature scenes of which he shared with many. He is survived by is two children, Marlene (John) Kultgen and Mark (Lonne) Schreiner, both of the Town of Port Washington, 3 grandchildren Kelly (Brian) Schowalter and Steph and Tony Schreiner, his sister Germaine Meyer of Port Washington, great-granddaughter Emily Schowalter, Step-children John Weyker of King, WI and Tom Weyker of Sturgeon Bay, 2 step-grandchildren and 3 step-great grandchildren, other relatives and friends. He is also preceded by his sister Anna Marie Poull and 3 brothers James, Charles and William Schreiner. His funeral mass will be celebrated at 6:30PM Thursday, July 21, 2005 at St. Mary’s Catholic Church, Port Washington. Interment will take place in the parish cemetery. Visitation will be held from 4-6PM Thursday at the Poole Funeral Home, Port Washington with a 4PM rosary. Memorials to the church appreciated.